Product #835 | SKU BEC1 | 0.0 (no ratings yet) Thanks for your rating! The C-1 is a cardioid condenser microphone designed to capture your sounds with incredible realism, sensitivity and accuracy. The C-1 is an affordable, high-quality way to put this essential studio tool to work for you. Thanks to its cardioid (heart-shaped) pattern, the C-1 microphone picks up your source signal while rejecting off-axis sounds that can ruin an otherwise perfect recording. With its excellent transducer and gold-plated XLR output, the C-1 is very neutral sounding and truly delivers on the promise of noise-free transmission. 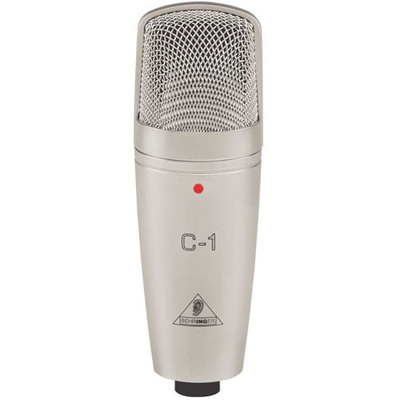 The C-1 is built to be your go-to condenser mic for years to come. Its tough, die-cast body can withstand all the rigors of bleary-eyed late-night recording marathons. And with its rugged foam-padded carrying case, it travels in safety and style. We also included a swivel stand mount so it can be affixed to your studio's mic stands. This condenser mic is an excellent choice for live and studio applications, and it's available at a price that will leave you with enough cash left over to secure other recording essentials.